Treasure Mountain, elevation 13,535 ft (4,125 m), is a summit in the Elk Mountains of western Colorado. The mountain is in the Raggeds Wilderness southeast of Marble. The massif has been the site of marble mining and a legend of lost French gold. Treasure Mountain forms a single massif with Treasury Mountain, elevation 13,462 feet (4,103 m), that rises on the southeast. Another Treasure Mountain, el. 11,834 feet (3,607 m) is located in Mineral County, Colorado. Other peaks in the vicinity include Whitehouse Mountain, elevation 11,975 feet (3,650 m); Bear Mountain, elevation 12,373 feet (3,771 m); Crystal Peak, elevation 12,632 feet (3,850 m); Purple Mountain, elevation 12,856 feet (3,919 m); and Cinnamon Mountain, 12,293 feet (3,747 m). The Ruby Range extends southward from Treasury Mountain forming the east boundary of the Raggeds Wilderness. The Yule Lakes are a series of lakes situated on the southern slopes which drain into Yule Creek and feeds Beaver Lake east of Marble. The watershed is part of Crystal River basin which drains the northern slopes of Treasure Mountain and is the northeastern boundary of Raggeds Wilderness. Yule Pass, south of Treasury Mountain separates the Raggeds Wilderness of the Sopris Ranger District from the Gunnison Ranger District and leads to the southeast along the Slate River drainage. 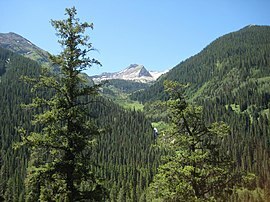 Yule Pass is to the east of the headwaters of Yule Creek. The Colorado Yule marble (a.k.a. Yule Colorado marble) comes from the Leadville Limestone of Mississippian age quarried near the mountain. It was formed by contact metamorphism in the Tertiary period following the intrusion and uplift of nearby granitic Treasure Mountain dome. Yule marble was used in the building of the Lincoln Memorial. The Yule marble quarry is at an elevation of 9,300 ft (2,800 m) on the west side of Treasure Mountain along Yule Creek. The quality and durability of the Yule marble was questioned prior to the building of the Lincoln Memorial as was the recently opened quarry's ability to provide the quantity and size required for construction. The original name of the peak was Citadel Mountain. The current name came from an ill-fated French mining expedition described in folklore documented in the 1930s and 1940s. The folklore states that the expedition was organized in the late 1700s by Napoleon Bonaparte, who needed financing to fund his ambitions. The expedition was reported to have consisted of 300 men and 450 horses. They left New Orleans and traveled through Leavenworth, Kansas en route to the Rocky Mountains. The folklore claims that a large amount of gold was discovered and amassed by the expedition near Wolf Creek Pass. The local Native Americans were reportedly initially friendly, but relations deteriorated. In the folklore, the French buried the gold and escaped from the area, pursued and hunted by warriors. One survivor, by the name of Le Blanc, made it back to Kansas. He was the expedition's historian and was reported to have made two maps of the hidden treasure. A later expedition failed to find the treasure. William Yule, many years later, claimed to possess a copy of the original map and explored the area south and west of the mountain. The mountain was named after the legend of the missing treasure. ^ a b "Tri Centennial Thirteeners". Archived from the original on 2013-03-10. Retrieved 2012-09-10. ^ The elevation of Treasure Mountain includes an adjustment of +2.008 m (+6.59 ft) from NGVD 29 to NAVD 88. ^ a b c "Treasure Mountain, Colorado". Peakbagger.com. Retrieved October 22, 2014. ^ a b c "Treasure Mountain". Geographic Names Information System. United States Geological Survey. Retrieved October 22, 2014. ^ "Treasury Mountain". Summitpost.org. Retrieved 2012-09-12. ^ "Treasure Mountain, Mineral County". Geographic Names Information System. United States Geological Survey. Retrieved 2012-09-15. ^ "Treasure Mountain A". Summitpost.org. Retrieved 2012-09-10. ^ a b c d McGee, Elaine S. (1999). Colorado Yule Marble - Building Stone of the Lincoln Memorial. Washington: United States Government Printing Office. U.S. Geological Survey Bulletin 2162. ^ Vanderwilt, John W. (1937). Geology and Mineral Deposits of the Snowmass Mountain Area Gunnison County, Colorado. Washington: United States Government Printing Office. ^ Gaskill, DL; Godwin, LH (1966). "Geological map of the Marble Quadrangle, Gunnison and Pitkin Counties, Colorado". USGS. Geological Quadrangle Map GQ-512. ^ Vanderwilt, JW; Fuller, HC (1935). "Correlation of Colorado Yule Marble and other early Paleozoic formations on Yule Creek, Gunnison County, Colorado". Colorado Science Society Proceedings. 13 (7): 439–465. ^ Ogden, Lawrence (1961). Berg, RR; Rold, JW (eds.). "Non-metallic minerals from rocks of lower and middle Paleozoic age". Symposium on Lower and Middle Paleozoic Rocks of Colorado, Twelfth Field Conference. Denver: Rocky Mountain Association of Geologists: 190–194. ^ a b c d Motter, John. "Where's the French Treasure?". Pagosa Sun. Retrieved 2009-02-12. ^ a b c Bancroft, Caroline; Nafziger, Agnes (1961). Colorado's Lost Gold Mines and Buried Treasure. Big Earth Publishing. p. 35. ISBN 0933472161. ^ Walker, Johnny. "Treasure Mountain". Heritage and History, Colorado Adventure Guide. Archived from the original on 2012-08-14. Retrieved 2012-09-10. ^ Adams, Maynard Cornet. Treasure Mountain. ^ Jameson, W. C. (2001). Colorado Treasure Tales. Caxton Press. p. 127. ISBN 0870044028. Adams, Maynard Cornet. Citadel Mountain III - 1885-1920. Fort Lupton, Colorado: MCA Books. Mutschler, Felix E. (1968). Geology of the Treasure Mountain Dome, Gunnison County, Colorado. University of Colorado. p. 13. Thesis. This page was last edited on 12 December 2017, at 12:25 (UTC).